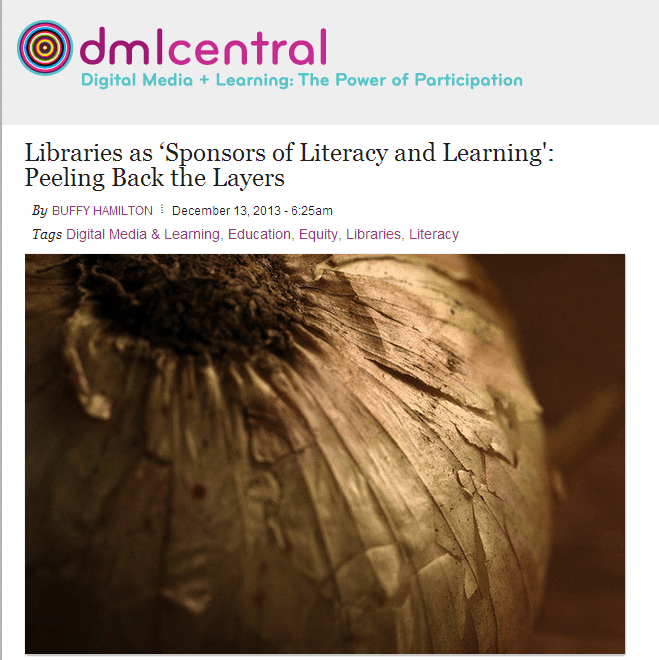 Thanks to Buffy Hamilton for a superb post on “Libraries as ‘Sponsors of Literacy and Learning’: Peeling Back the Layers” in DMLCentral blog (make sure this one is in your RSS feeds). What is the library’s strategic plan and what values are embedded in it? What assessment measures and strategies does the library use? Do the assessment measures actually evaluate the intended outcome? Is the assessment tool valid? What kinds of assessments might the library use to see how learners are using knowledge and understanding gained through a library learning experience in other “spheres” or worlds of learning? What kinds of data do the library collect and how is that data used? What access does the library have to community data that may be useful or informative? What data visualization techniques might the library use? How is the impact and effectiveness of programming assessed? What kinds of learning opportunities are available to patrons of different ages? What kinds of literacies and skills are taught through these learning opportunities? What, if any, models of instructional design inform the ways these learning experiences are provided? What learning theories, if any, inform the design, delivery, and assessment of learning experiences? Are there opportunities for library patrons to request specific kinds of learning opportunities and/or participate in the organization or delivery of these services? What self-sponsored literacies of patrons are valued and supported by the library? Do learning opportunities emphasize creation of content in multiple mediums as well as consumption? Kim Mitchell, rock ‘n roller, has a great radio show called “DAMN I wish I wrote that!” I’m echoing that refrain here, Buffy Hamilton; this is a highly valuable blog post – “Damn – I wish I wrote that!” Keep it up Buffy – look forward to more.